"As a long time collector and restorer of fine Vintage Timepieces, I have always been interested in Stauer's innovative styling and designer collections that are retro inspired." The Stauer Metropolitan Watch is no exception following the lines of some of my own favorite timepieces of the past. Movement is a quartz that utilizes battery 377(SR626SW) with a beautiful Dial and Blue Breguet Hands that match the Sapphire colored crown. Date is positioned at 3:00 and easy to read and set. Large Gold-Tone Case at 40mm will stand out on any wrist. I would love to give this watch 5 Stars but the Black Croc embossed Leather Band is a little too long for my wrist and too heavily padded for my likings. I have replaced with a Hirsch "Duke" Dark Blue band that matches the Hands and Sapphire. Otherwise Watch runs accurately and is a another great addition to my Stauer Collection of Watches. I should also mention I am a Stauer Member as well as a National Geographic Society Member. This is a really beautiful Timepiece. I especially like the blue hands and saphire look crown. The date is easily read as well. This watch looks 10 times more expensive than what you pay. 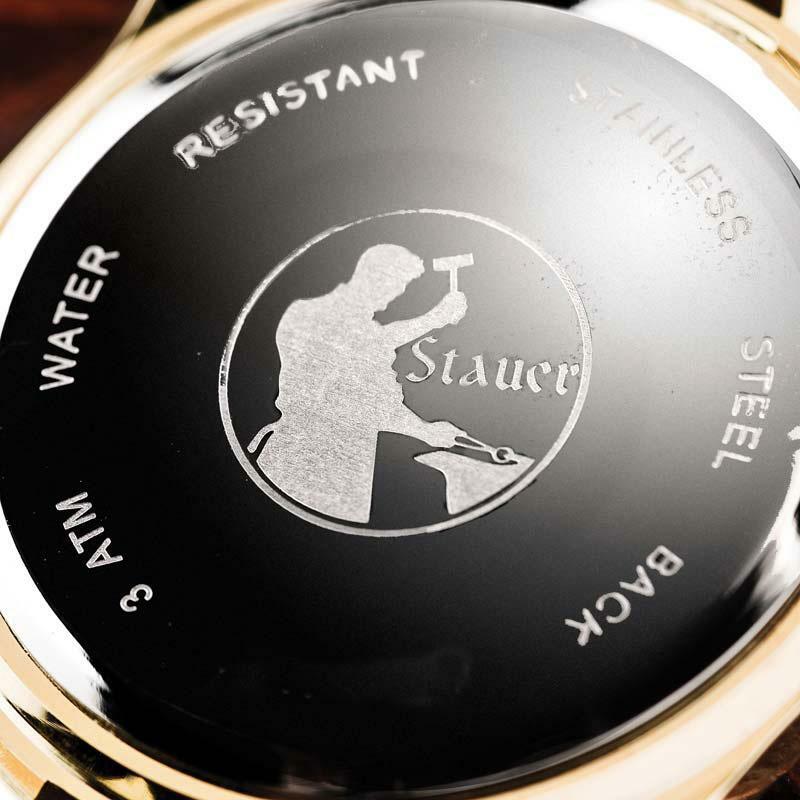 -Very proud to add any Stauer watch to my collection of Stauer products. I received my Metropolitan watch about 5 days ago. When I open the box I was in shock! This watch is absolute amazing. Identical to the picture. Very finely done in every detail. Last Sunday I went to church and a lot of gentleman were asking about this watch. Then, I could not stop using it and I bring it with me to the university and again a lot of young guys were impressed with the watch. I am thinking to buy another one! You will not be disappointed. This is a masterpiece. It's beautiful! I want one in women's size! I bought this watch on a whim. I liked the look of it: the Roman Numerals, gold plate, Breguet hands, and guilloche dial. It is stunning in person and the dial is extraordinary. It's the perfect size, sits well on the wrist, and has quartz accuracy. The strap is long and of good quality. I would highly recommend it. It's my first Stauer watch and I'll probably be a repeat customer. Acquired this watch via a promotion sale and have grown to like it more every day. Looks great, keeps perfect time, and gives me an excellent alternative to my other every day and dress watch. Now scouting future Stauer watch promotions for my next watch, already picked out. This is the first dress watch I have ever bought and the first watch I have owned in quite a long time. It is very sharp and have received many compliments. PS. I like that the band is large enough to fit my wrist. I had recently been searching online for some high end watches and came across this one for a great price. I was really attracted to the classic look with the Roman numerals and intricate face. I received some money for a birthday gift and with a recent promotion on this watch, it was the perfect amount, so I decided to order my first watch from Stauer. It arrived 2 weeks ago and I have been enjoying wearing it every day since. It is very light with the leather band and is not too thick like some newer watches. My wrist is small so I have to use the last or second to last hole but it fits snugly and looks great. I'm really enjoying it so far. Purchased for Christmas this year, picture does not do this timepiece justice; just beautiful, and has kept perfect time with the Citizens watch I usually wear every day. This will become my dress watch, and will be complemented, I am sure. Thanks Stauer, this is a home run for the price! This watch spoke to me on first sight, recalling the old world, all its panache, and how such things never really go out of style. I could see this watch on people like Ebenezer Scrooge--yes, the man himself--and somehow, I knew how it would look on me and that was it. With this watch, checking time is a treat, and I thank my lovely wife who made it happen on Christmas morning. PS: Don't misconstrue about myself and Scrooge. He's better looking! As some others have said, the watch in person is much nicer than the picture. What really impressed me was how accurate the Metropolitan is. I was away and left it for almost two months. Upon return, I compared it with atomic time and found it to be exact. Really nice, really accurate. I was looking to buy a watch by Stauer, thinking a little pricey for me, but still a great gift to my husband. I am definitely not buying anything from Stauer until you stop using any sort of IVORY, whether it is from Elephant or Rhino or anything that involves the death and torture of any animals. I called them animals but the worse animal are human being hands down like your company that really does not need to PUT IVORY ON THE FACE PLATE of the watch. How can a billion $ company Use the word "antique" in front of IVORY because that is the only legal way you can say it without have legal issues with the world. I've had this watch for many months now. Keeps perfect time, and looks great on the wrist when in formal dress. Not too big, or too small, just perfect. Black leather band is first rate and compliments the watch well, and you forget it's on your wrist. One of my favorite watches to wear. Price is unbelievable for this quality. Easily a two hundred dollar watch. My first Stauer watch! I bought it because of the price and was truly amazed at the quality and look of the watch when it arrived. I have received several compliments while wearing it. I'll be a repeat customer! My favorite watch. Very classy. Unfortunately, I dropped it and broke the crystal. So, at the price of a new band and battery; I bought a new replacement. This is my first Stauer watch and, if it's indicative of their what he's, it won't be my last. It is very nice and I wear it proudly. This is a classic watch that looks great and keeps time perfectly. The price is probably so low that it sells at cost or below to introduce customers to their other lines. It worked. I already bought another watch from them and am equally happy. This is my first purchase from Stauer. I have had this watch for a while now and am very pleased with it and have gotten more than a few compliments on it. It keeps good time and is holding up well. For the price I payed it is well worth it. This is the first time I've seen an article advertised that is not an exaggeration. It exceeded my expectations. I do not like bulky watches, and this is not one of them. I prefer the thin watches, like the men's watches used to be in the 50's, 60"s and 70"s, but this one I can accept. It keeps great time, it's great to look at, and I feel proud to wear it. It was a special gift from my son who knows I really like watches. I collect quality Movado, Mido, Bulova, Citizen, Lucien Piccard, Paul Maret, Seiko, Longine, and Sultana watches, and this one fits comfortably among them. Great great value for the price. Elegant watch you will wear for board meeting at 9am. It looks and feels better on your wrist. The Stauer Metropolitan is my first Stauer watch and I'm extremely pleased with it! It is every bit as beautiful as I'd imagined. After 2 weeks it keeps perfect time, feels and looks great! It's perfect for dress or casual. Two thumbs up! I have bought many watches from Stauer. All great at keeping time and all very handsome. This watch is at the top of the mountain. Stylish in an understated type of way. Very light and most comfortable to wear. On sale now and I highly recommend to all shopping for an highly affordable, pleasure to look at watch keeping excellent time (all Stauer watches do) buy ASAP. Enjoy! My watch came in the mail today and I couldn't stop looking at it! Quality all the way, I don't have a small wrist and it fit perfectly. Fit and finish is amazing, something to be proud of, can't wait to show it off, can't stop smiling. Thank you! I am a grandfather with numerous children and grandchildren. Needless to say, the Metropolitan is such a hit that I cannot keep one. I am so very happy that I have something that they admire and want. Thank you for keeping this price. I really like all of the watches that I get from Stauer. Nothing like the picture. Gorgeous watch. Working my way up to the steel Noire beauty. I love my watch it is so stylish and sometimes I forget I am wearing it. I have been wearing this watch for three days and love it. I can easily read the date. The price is unbelievable when you see this watch. A beautiful watch: I love everything about it. I bought one years ago for my son-in-law, and he loves it. He says it runs like a charm and it gets a lot of compliments. 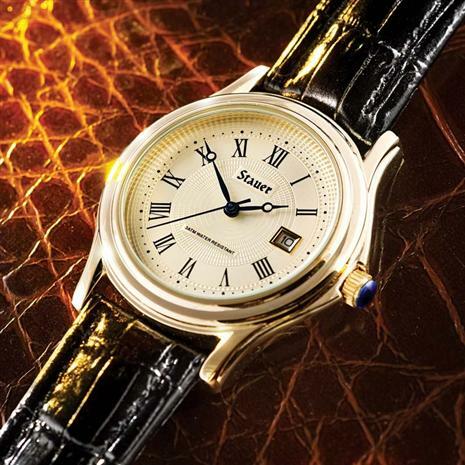 It reeks of class: the face, the hands, the day window, the case, the strap (which still looks great), you cannot beat it, and at Stauer's new price? C'MON! Great watch. Light weight, handsome, ELEGANT! I was impressed with the looks of this watch, but at the very low price I didn't expect the accuracy! Off only seconds in the last month! This watch is as accurate as my far more expensive Seiko--perhaps even better! Only one problem--the band has lost both loops that allow it to be worn properly. The band looks nice, but only for awhile. I prefer a good metal expansion band anyway but you might offer such a band with this watch. Amazing watch; looks, size, weight all far, far beyond what one would expect from a watch costing a couple hundred dollars more than this beauty. If it weren't for the band, I'd give it five stars (and six if it were possible). The band is o.k. but after awhile just came apart. Put a quality expansion metal band on this and charge double the price and it would be the best deal Stauer offers. Meanwhile I'll look for a good expansion band. Love the watch though! Our modern take on a 1929 classic, yours for this unbelievably nostalgic price! You have a secret hidden up your sleeve. Strapped to your wrist is a miniature masterpiece, composed of over one hundred tiny moving parts that measure the steady heartbeat of the universe. You love this watch. And you still smile every time you check it, because you remember that you almost didn't buy it. You almost turned the page without a second thought, figuring that the Stauer Metropolitan Watch was just too good to be true. But now you know how right it feels to be wrong. Tells today's time with yesterday's style. The Metropolitan is exactly the kind of elegant, must-have accessory that belongs in every gentleman's collection next to his British cufflinks and Italian neckties. Inspired by a rare 1929 Swiss classic found at auction, the Metropolitan Watch revives a distinctive and debonair retro design for 21st-century men of exceptional taste. Modern technology with a vintage price. The Stauer Metropolitan retains all the hallmarks of a well-bred wristwatch including a gold-finished case, antique ivory guilloche face, blued Breguet-style hands, an easy-to-read date window at the 3 o'clock position, and a crown of sapphire blue. It secures with a crocodile-patterned, genuine black leather strap and is water resistant to 3 ATM. Your satisfaction is 100% guaranteed. We are so sure that you will be stunned by the magnificent Stauer Metropolitan Watch that we offer a 60-day, money back guarantee. If you're not impressed after wearing it for a few weeks, return it for a full refund of the purchase price. But once the first compliments roll in, we're sure that you'll see the value of time well spent!